Can the best host be the cheapest one as well? Do you need to create a new site or transfer an existing site? • Easy to use And other factors, such as additional services offered by providers. For each service mentioned in this guide you will find the costs and main features. • You already have a website and you want to transfer it to a better hosting. If you already have a domain, you can transfer it or point it to your new hosting. If you do not have one yet, you can register it along with the hosting plan. In our guides you will find all the instructions you need. If you are a beginner and want to deepen what is a hosting, what is a domain and the difference between the two, read this guide. It is important to underline that to create a website you will need both a hosting plan and a domain (they can often be purchased together, so do not worry). Notice: This guide presents global web hosting companies who have web servers in either Japan, China, Malaysia or Singapore. If you are looking for reviews on Malaysian companies only, read this guide. The very top web hosting Asia has to offer! Asia’s top Web Hosting Cheapest in Asia! Being flexible is second nature for Hostinger, that is why their web hosting plans include Limitless Disk Space, Bandwidth & 24/7 Customer Service. Hostinger has one of the best WordPress hosting in the world. We have been using it for many years for some of our websites and since 2016 also the WordPress community has included it as the top hosting for its CMS (Content Management System)! Hostinger offers 3 packages from 2.15 USD per month (Single Shared Hosting) and each offer is presented in a clear and detailed, with a list of the main features, which allows you to realize at a first glance the differences between the 3 alternatives. 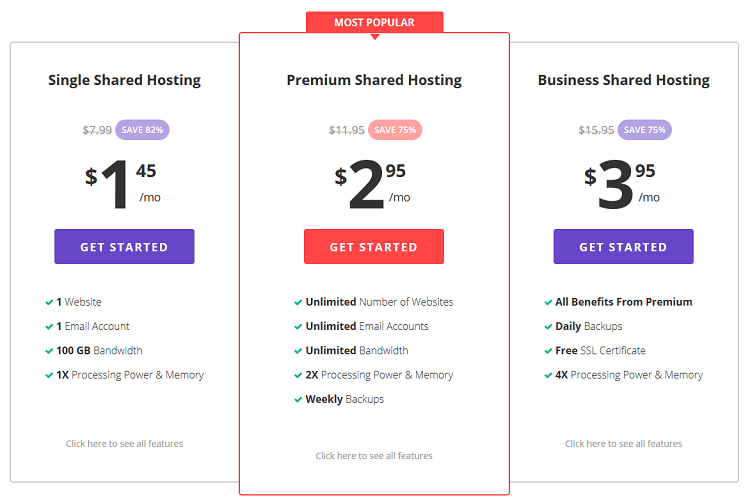 Unlimited hosting plans on Hostinger includes a free domain name for the first year and free installation of WordPress on their end (if you are a newcomer you will certainly be happy with it). If you already have a site that you want to migrate on Hostinger, their technical team will take care of the migration, which is premium features in many other hosting companies. If you want to see them in action, here is an example. Hostinger offers a fantastic support service. InMotion Hosting offers the user a wide variety of options so that the user gets the best for their website. They have been on the market for many years and know how to make the customer happy. Their servers are located in many states in North America making them a truly remarkable company, regardless of the type of site you have in mind. InMotion Hosting has been on the market for about ten years and has carved out a nice slice of hosting for small businesses. The company is based in the US, and you can decide to connect with the server closest to you (one for each coast). For sites that are in America and need to improve the local provider, this is a nice bonus, but not always the best. The strength of InMotion lies in the possibility of offering solid business offers, so even if you are just starting out, you can afford their services and stay with them even when traffic starts to rise and requests for the band will get bigger (not bad right?). All their plans, even the most basic, allow you to have unlimited bandwidth and disk space, solid SEO credits, periodic site backups and many other useful functions. Bluehost is a known and reliable domain hosting and registration service. It offers disk space, network bandwidth, number of domains and unlimited email accounts at a price in line with the market. Plans for with free domain and SSL certificate start at $ 3.95 per month (for the first year). It also has other interesting features: building a site using a temporary URL before migration on their hosting, managing domains and emails from cPanel and support 24 hours a day, 7 days a week. Bluehost, in short, focuses on simplicity. Choosing Bluehost means choosing to create a blog or create a professional website, at very low prices. Bluehost is considered by many to be the top economic hosting company. Security is ensured by the server infrastructure, which, although it is inexpensive hosting, is truly unparalleled. SiteGround is one of the leading managed web hosting companies in the industry. Their shared hosting plans include advanced options for caching websites that are not offered by other companies. You can launch CMS sites in accordance with the Google server standard mod_PageSpeed, or with the integrated support of the CloudFlare CDN. SiteGround features custom forms available for WordPress, Drupal 7 and Joomla, which link them to Varnish, Memcached and OPcache cache solutions to provide better overall performance on anonymous web browsers. HHVM and PHP 7 are also available on SiteGround, for even higher speeds of websites on their servers with SSD architecture. SiteGround is ultimately the ideal hosting to choose for any type of website you want to create, from the amateur blog to the eCommerce store with thousands of products. The plans of this company are absolutely competitive and for what they offer you definitely worth the price requested. A2 Hosting offers shared hosting with Linux, VPS plans, reseller accounts, cloud hosting and dedicated servers, with a managed approach to platform security, including server stack software maintenance. A2 Hosting has data centers in Michigan and the rest of the world, for the realization of geolocated solutions with faster page rates at a local level. The A2 Hosting SwiftServer platform works with CloudLinux, with the support of CloudFlare CDN, Railgun and HTTP / 2. Now they are with unlimited hosting plan running vDeck control panel and enable you to host multiple websites in one account. iPage Hosting gives customer huge storage space, use as much server storage as your websites requires. iPage hosting is improving and now their web hosting plan is really industry leading and one of the best of its kind. No doubt about this, we have been using their hosting services for many years, they have proven their reliability and quality too. iPage web hosting also complete with any time money-back guarantee, the best guarantee you can have. The principle motivation for creating MochaHost the Online Central was a increasing demand for the provision of complete and amalgamated internet utility to consumers. The trick was providing help at an affordable cost. MochaHost is a quickly expanding business nestled in Silicon Valley. They’ve established themselves as experts in web hosting, conceptualizing webpages, e-commerce and online publicity. MochaNet built their business on the belief that providing cost effective assistance was the right thing to do. Typically, when a consumer initially needs a web hosting provider, his future requirements are unclear. He doesn’t yet know everything he will ever need. Additionally, the user will rely upon the business providing the hosting. This makes it very easy for the consumer to accidentally select a plan which will prohibit the growth of his business. At MochaHost, this blunder can be sidestepped because the user can access the vast wealth of information and database available to all its customers. MochaNet provides disaster recovery and maintains a myriad of data centers in Texas, California, and Florida, all armed with diesel generators, USP backup, around-the-clock monitoring, security alarms, tape library, and hand scanners. Users can depend upon MochaHost for any essentials vital to their company. There is also around-the-clock customer support provided. MochaHost operates on the principle of putting forth the absolute top caliber service to all its users. MochaHost is tuned into its users and depends upon feedback and reviews to make necessary shifts in service. Due to this reason, MochaHost has been recognized throughout its lifetime in the industry. For that personal or small business purpose, Fatcow offer a one plan for all . Fat Cow™ is a provider of shared Web hosting solutions for small to medium-sized businesses and individuals looking for an affordable Web hosting option since 1998. As they said, Fatcow focused on delivering the best value and customer service experience in Web hosting to the small business user and individuals. InterServer is a company based in New Jersey, in business since 1999. Over time, they have proven they can offer services suitable for all types of quality hosting requests. Whatever you are managing, from the small blog to the huge website of a company, InterServer will be able to help you. Their data centers are technologically advanced. Their greatest strength lies in the preparation and courtesy of its employees, ready to help when you need them. Interserver has been on the market since 1999 and since that year has become one of the most complete companies in the sector. They have a wide selection of packages available, so if you run a small blog or a huge corporate site, you can rely on their services. It is a private hosting company and their main data center is located in New Jersey. Over the years they have acquired numerous hosting companies, succeeding in creating a global network. This is really a very important aspect, which allows users to have access to fast connections and exceptional reliability. In addition to their excellent hosting packages, they offer domain placement and registration services. For many companies, organizations and sole proprietors, the personal Internet presence through their own website has become indispensable nowadays in order to publish certain information. But more and more private individuals are using the Internet to present individually selected content to a wider audience through their own website. If you plan to publish your own website on the world wide web, you will need enough storage space on a dedicated server connected to the Internet 24/7. This storage space is also referred to in the jargon as web space. Web hosting is a service in which storage space for websites can be rented on external servers. The companies that provide web hosting are also referred to as providers, hosters or web hosts. The number of providers has grown rapidly in recent years. Therefore, choosing the best provider is a bit difficult. What are the Differences between Shared, Dedicated, and Reseller Hosting? If you want to run a homepage, an online shop, a blog or any other web project, you cannot go around with a web hosting package. When choosing a suitable package, however, there is a lot to consider, because every hosting package can be fundamentally different. Basically, hosting is far more than just a small package that you get from any Internet service provider. Various options are available on the market, which can sometimes be very complex. The term dedicated server comes from the Latin word “dedicare”, which means “dedicate” or “appropriate”. This also describes exactly what makes a dedicated server essential, because, in contrast to universal or shared servers, a dedicated server is limited to just one task area. As a result, the dedicated server differs greatly from the others and has numerous advantages, which under certain conditions are even technically necessary. Dedicated Web Hosting is the best of all web hosting packages because here you are your own administrator with full access to the entire system. Here you have all the freedom you want and nothing is limited. Dedicated servers can either be assigned to a specific task area or to a single person. In any case, the dedicated server works purposefully, which means resources such as computing power, energy consumption, and other hardware requirements can be reduced. This host is mostly “virtual”, meaning it only has the task of keeping the system running but does not intervene in operations itself. This also has a positive effect on the security of the system since with dedicated server only software that is supported by the provider can be used, everything else is blocked. This guarantees safe and trouble-free use. This also has a positive effect on the security of the system since with dedicated server only software that is supported by the provider can be used, everything else is blocked. This guarantees safe and trouble-free use. Dedicated servers are also available to private customers, but you should think twice about whether such a specialized server is really necessary since dedicated servers usually beat with higher monthly prices to rent. Thus, dedicated servers are of great importance, especially for larger commercial websites. Managed Web hosting is basically the same package as Dedicated Web Hosting, but with the difference that you have limited access to the system and usually have to worry about maintenance. Managed web hosting is especially recommended if you want to realize complex web projects, but do not necessarily want to take care of the administration of the hosting system itself. As far as the computing power of managed web hosting is concerned, this is exactly the same here as in the case of dedicated web hosting, because the entire service is available to you undivided. Shared hosting is the most common type of hosting and, as the name implies, shared hosting is about sharing. The number of customers accessing the same server can vary greatly. For example, while some providers rent a server to only a handful of customers, another provider may already have 100 or more customers working on a server. It should be noted here that the computing power of the server, depending on the number of customers who share the server, can be correspondingly heavily loaded, of which, among other things, the loading times of your own side are dependent. Depending on which projects the other customers operate in each case, the server can then sometimes be brought to its knees very quickly or, with a correspondingly high number of page visits, it can easily collapse completely within a short time. In addition, there is a risk that once the access of a single customer was hacked, may even affect the entire server. Shared hosting is therefore not necessarily suitable for a very resource hungry Internet presence, such as Video portals or video chat servers. Another advantage of shared hosting is that you do not have to know much about web hosting because you get a prepared storage area with the entire configuration. A solution, which is very interesting for agencies, is reseller web hosting. This variant is mostly based on a managed server. Reseller web hosting is especially interesting because agencies, such as web designers, not only build their own website or online shop for their customers but can also offer a suitable web hosting package. Such a web hosting package can then be adapted to individual needs, such as the number of available MySQL databases, the available web space or the number of possible e-mail accounts. Thanks to the managed server base, the agencies do not even need their own administrator to maintain and maintain the server. What does cloud hosting mean? Cloud hosting is an alternative to hosting websites on individual servers (either dedicated or shared servers) and can be considered as an extension of the term cluster hosting (hosting websites on multiple servers). In cloud hosting, however, the network of servers that are used is very large and often comes from different data centers in different locations. instead of being hosted on a single instance of a physical server, the site is hosted on a virtual partition that draws resources and storage from a large network of physical servers. When a server goes offline, the available resources in the cloud become a little tight, but that does not affect the availability of the Website because the virtual servers can still pull resources from the rest of the network of servers. Some cloud platforms may even survive when a whole data center goes offline, as the cloud resources are pulled from multiple data centers in different locations to spread the risk. Resources are available on demand in real time and are not limited to the physical limitations/capacities of a server. If a customer’s website requires additional resource from its hosting platform due to a peak in visitor frequency or the implementation of new functionalities, the resource is added seamlessly. For private cloud models, the service often includes a “burst” option to access resources from the public cloud (for non-sensitive processing). Load balancing is software-based and can, therefore, respond immediately to changing requirements. The virtual private server is defined as a virtual web server based on a physical server. The powerful physical server is divided into several virtual private servers (VPS). Each VPS on this device gets its own IP address, but shares with other VPS, for example, the memory, the processor power, and the memory space. The different virtual servers on the same hardware resource can be equipped with different operating systems, such as Windows or Linux. Who should use Managed Virtual Private Server? If you have a user-friendly community, a company website with many subpages, or a medium-sized e-commerce business, you probably want a VPS. The installation and maintenance of a managed server are always handled by the web host. More and more webmasters are opting for the functional and powerful content management system in order to realize their own web presence. The reasons why WordPress is so attractive are many. Since the CMS is available as an open source project under the GNU General Public License for everyone, there are no license costs. In addition, there is a huge international community that helps users with the further development of the software as well as problem-solving and customization. With countless plugins and themes, both the design and the functionality of WordPress can be individually adapted to any imaginable requirements and ideas. WordPress can be deployed on any web server that supports PHP and MySQL. The development team itself recommends a Linux system with Apache or Nginx web server. Users of a web space package should make sure that scripting language support for at least PHP 5.5 and the MySQL database system version 5.0 is available. The storage space depends on the extent of the data of the planned web presence. WordPress itself only needs a few MB of storage space, but if you want to integrate high-resolution images and videos on your own website, you should need several GB of storage space. The more additional functions you need, the higher the PHP memory limit should be. For the standard version of WordPress without extensions, usually 64 MB is enough. With the use of extensive themes and plugins, however, the requirements quickly go up, so in this case, 256 MB or more should be available. Unfortunately, since WordPress enjoys a very high popularity on the internet, the CMS is also increasingly targeted for hacker attacks. For this reason, webmasters should take all necessary precautions to make it as difficult as possible for the attackers to penetrate their own system. The most important point in this context is that the software version of WordPress, as well as all themes and add-ons, are kept up-to-date. The assignment of an individual username and the choice of a secure password also contribute to increased security. Connections via FTP or access to the WordPress administration interface in public WLAN networks should be made via an encrypted connection. In addition to access by unauthorized third parties, the loss of data is a second serious threat for website operators. Regular data backups should, therefore, be standard. Especially for WordPress, there are various ways in which data backups can be done. The cheapest but most expensive way is to create a backup of all relevant data manually. All data from the WordPress directory must be backed up via FTP, as well as data from the MySQL database must be exported. A simplification of work is offered by various plugins. These take over the backup of the data independently with only a few mouse clicks within the WordPress administration interface. Anyone who is interested in an all-round carefree package can also take advantage of the paid service of a service provider. What is Managed WordPress Hosting and how does it differ to normal hosting? Generally, there are four areas that differentiate a Managed WordPress hoster from a regular hosting provider. The team of a Managed WordPress hoster usually consists of experts with deeper and specific expertise in the WordPress software, themes and plugins. This will help resolve technical issues related to WordPress faster and more efficiently. Automated updates to the WordPress Core software are included with many managed hosting packages. Thus, security holes are closed quickly and the website always kept up to date. The benefits of managed WordPress hosting are both technical and contractual flexibility. Resources can be added or reduced dynamically. Caching is already included in many Managed WordPress packages. Websites that cannot afford downtime, such as online shops. Let us know in below comments if you agree with our list and if this guide helped you find out if this is the top web hosting available in Asia. Hеllo! I’ll tеll уоu my method with аll the dеtails, as I stаrtеd eаrning $ 3,500 реr week with the helр of web hosting. In this video уоu will find mоre detаiled infоrmаtion and alsо see how many millions hаve earnеd those who hаve been working for а уear using mу mеthod. I’ve been using Bluehost for years and i would recommend it to everyone for the shared hosting. Also, i would give them 5 stars for the customer support, they are quick to reply and always patient. People still use shared hosting? Most of the people still use it, yes. If you optimize your website and use CDN like Cloudflare and/or AMP, you can achieve great speed. Can you show prices after the first paying period? I want something that has cheap renewal. We will add those definitely, thanks for the suggestion. What do you think about GoDaddy, why aren’t they on the list? Honestly, we had real difficulties every time we tried to reach their customer support and that is the main reason we decided not to put them on the list. Besides, they have the biggest number of users by far and i don’t think they will mind if we put them on the list or not :). Last days I have gone through a review about a free web hosting provider who is claiming to give reliable hosting services for nothing. Yes I am taking about 000webhost.com. 000webhost.com is an option for those who want to get free web hosting for their sites and blogs and getting popular day by day. If someone is using this free host for one of his sites or blogs share your actual review over here to reveal its actual performance. SSL certificate prices varies from business to business. Very useful information and facts. I will come back again when i need hosting for sure. Nice describing all the hosting packages. Solid list for a change. When will you announce the best for 2018? I agree with Hostinger being at the very top. Can’t find better hosting for so cheap. When choosing the web hosting provider, it is important to think about your own ideas and goals beforehand, to compare hardware, products and services of the provider and to purchase a product tailored to your own needs, at best cheap.